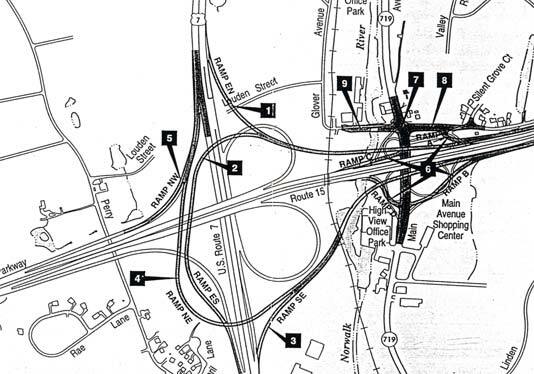 When Route 7 was extended northward in 1992 from its terminus then at Route 123 in Norwalk to Gristmill Road, the interchange with Route 15 was left incomplete. As a result, access between Route 15 and Route 7 was limited to points to and from New York City only. In order to obtain access to and from points toward Hartford and New Haven, one still has to travel via the old Route 7 (Main Avenue, Route 719) to Parkway Exit 40. The Connecticut DOT has studied several alternatives to completing the interchange, either making it a full cloverleaf, or constructing flyover ramps. The preferred alternative the DOT is studying is to construct flyover ramps to complete the interchange, while dowsizing the Main Avenue interchange (Exit 40) from a cloverleaf to a diamond configuration (See Map Below). This will give the interchange an appearance that is resemblent of the Route 8/15 interchange in Trumbull. The DOT is currently preparing final design of the interchange and the project is expected to go out to bid in late July 2002.